Defining 30 import files would be lots of work, and they would then need to be merged together. Defining 30 files and then NONE of them, or just one of them resolving would have made the transformation fall over at run time with metadata issues. I would also have to define 1 connection for each file….. Most importantly, it violates DRY principles. Thus if I ever needed the change the way SQL was selecting data from the files I would need to make it to 30 transformations, or more even! 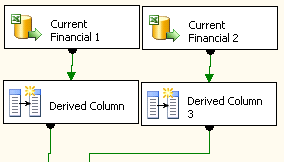 With a little bit of research I realised that this was exactly what I needed so without further ado I decided to implement a solution for my challenge using this component.I started at the start of course by firstly defining a new Excel connection (and ONLY one!) I set it to a file that represents the data that would be loaded at run time for each file loaded, remember that all of my import files are identical in format. 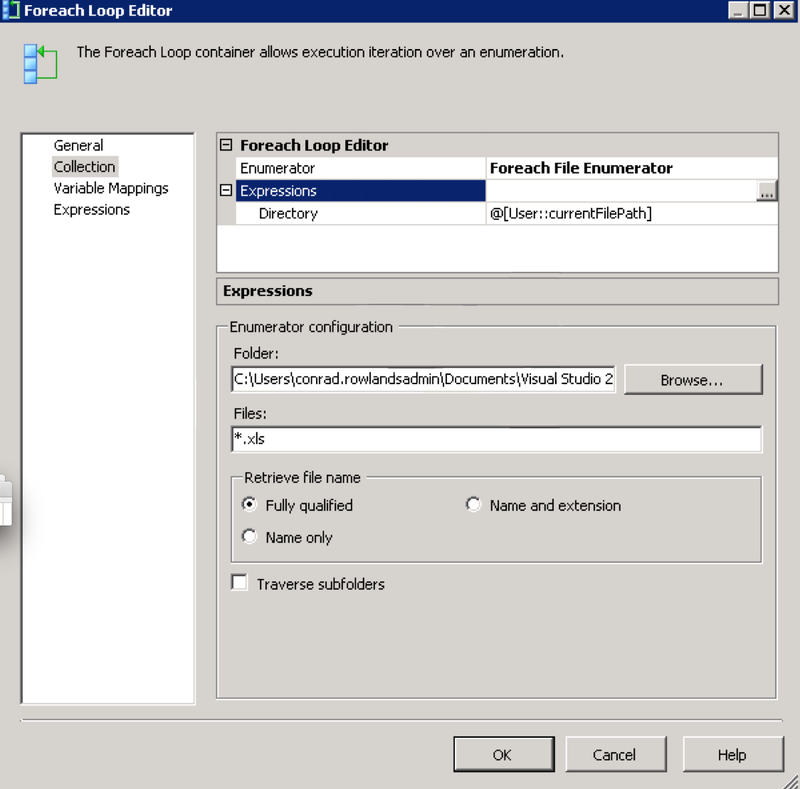 As you can see I have created ForEach File enumerator which determines exactly what sort of behaviour this component will perform, Note how I have then created an Expression (using the expressions Editor Dialog) which allowed me to specify ‘Directory’ as the Expression to set and the value that it is being set to is the value stored in my ‘currentFilepath’ Variable. I could of course have just hard-coded the value by just using the Browse dialog further down the screen. 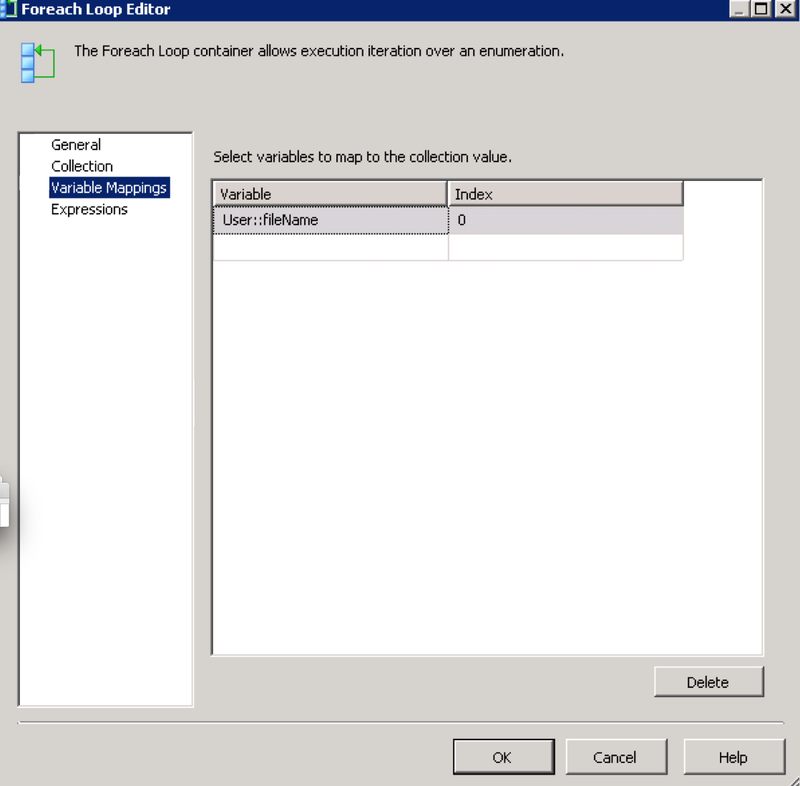 In my instance I only want to use ‘xls’ file, or office 2003 format Excel files and so using the ‘Files’ field I can specify only to use *.xls files. Finally, I want all of the file paths returned to me to be Fully Qualified Path names and so that it what I have selected. 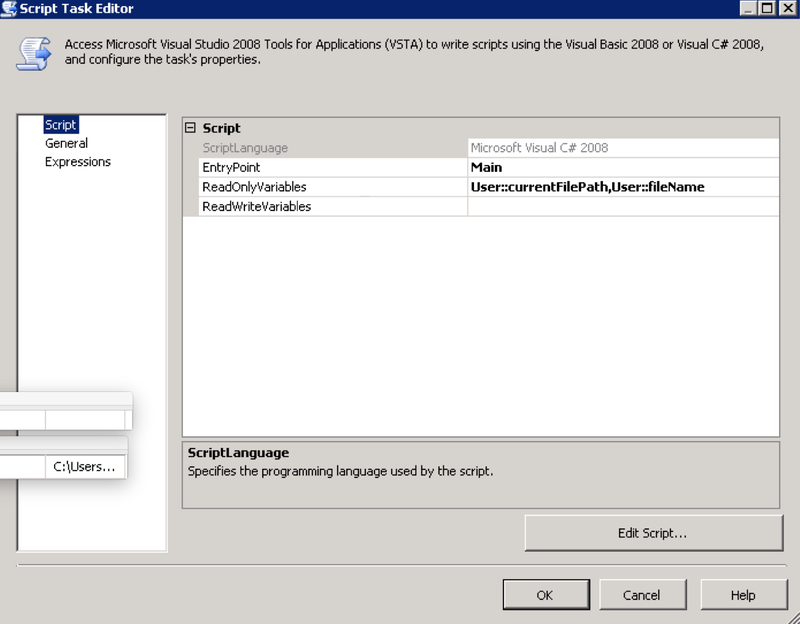 As you can see all we really do is obtain references to the Connection object and the ‘fileName’ variable (both by name). 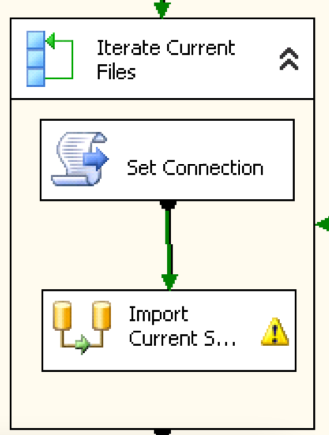 We then create a valid Connection string using our new file name and finally we set this new connection string into the ConnectionString property of the Connection object. That’s it, we’re done and now running the code we can see that it doesn’t matter whether there are zero or a million files within the directory it will process them (in no particular order) and add them to our staging table ready for full adoption onto the system. I’m pleased with this solution, its DRY’d my transformations up nicely and given me the flexibility I would not have been able to achieve any other way.